With the approval of several novel targeted agents for CLL, the costs associated with treating this condition have risen exponentially. Using data from patients in Olmsted County, MN, researchers estimated the total out-of-pocket drug costs in a 10-year period for a hypothetical cohort of 100 patients with newly diagnosed CLL. On April 11, 2016, the FDA approved venetoclax (Venclexta; Janssen) tablets, a first-in-class BCL-2 inhibitor for the treatment of patients with CLL plus chromosome 17p deletion, as detected by an FDA-approved test (Vysis CLL FISH Probe Kit), who have received at least 1 previous therapy.12,13 The FDA used its accelerated approval process based on the overall response rate data.13 Continued approval of venetoclax in this setting may be contingent upon verification and description of clinical benefit in a confirmatory trial. Venetoclax is the first BCL-2 inhibitor approved by the FDA for the treatment of patients with relapsed, high-risk CLL. Venetoclax is associated with high response rates, including complete responses without minimal residual disease. The median duration of response with venetoclax has not yet been reached after approximately 12 months of follow-up. 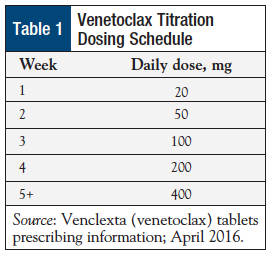 To mitigate the risk for tumor lysis syndrome with venetoclax, a 5-week dose titration schedule has been established. Premedication with antihyperuricemics and adequate hydration are recommended for all patients who start using venetoclax. Leukemia & Lymphoma Society. Chronic lymphocytic leukemia. www.lls.org/leukemia/chronic-lymphocytic-leukemia?src1=20032&src2=. Accessed June 15, 2016. Gribben JG. How I treat CLL up front. Blood. 2010;115:187-197. Cancer.Net. Leukemia-chronic lymphocytic-CLL: statistics. www.cancer.net/cancer-types/leukemia-chronic-lymphocytic-cll/statistics. Accessed June 15, 2016. Leukemia & Lymphoma Society. Chronic lymphocytic leukemia: signs and symptoms.www.lls.org/leukemia/chronic-lymphocytic-leukemia/signs-and-symptoms. Accessed June 15, 2016. Byrd JC, Furman RR, Coutre SE, et al. Three-year follow-up of treatment-naïve and previously treated patients with CLL and SLL receiving single-agent ibrutinib. Blood. 2015;125:2497-2506. Hillmen P. Using the biology of chronic lymphocytic leukemia to choose treatment. Hematology Am Soc Hematol Educ Program. 2011;2011:104-109. Drugs.com. FDA approves Imbruvica (ibrutinib) for the first-line treatment of chronic lymphocytic leukemia. www.drugs.com/newdrugs/fda-approves-imbruvica-ibrutinib-first-line-chronic-lymphocytic-leukemia-4353.html. Accessed June 30, 2016. Imbruvica (ibrutinib) capsules [prescribing information]. Sunnyvale, CA: Pharmacyclics; Horsham, PA: Janssen Biotech; May 2016. US Food and Drug Administration. FDA approves Zydelig for three types of blood cancers. Press release. July 23, 2014. www.fda.gov/NewsEvents/Newsroom/PressAnnouncements/ucm406387.htm. Accessed June 17, 2016. Zydelig (idelalisib) tablets [prescribing information]. Foster City, CA: Gilead Sciences; July 2014. Shanafelt TD, Borah BJ, Finnes HD, et al. Impact of ibrutinib and idelalisib on the pharmaceutical cost of treating chronic lymphocytic leukemia at the individual and societal levels. J Oncol Pract. 2015;11:252-258. US Food and Drug Administration. FDA approves new drug for chronic lymphocytic leukemia in patients with a specific chromosomal abnormality. Press release; April 11, 2016. www.fda.gov/NewsEvents/Newsroom/PressAnnouncements/ucm495253.htm. Accessed June 11, 2016. Venclexta (venetoclax) tablets [prescribing information]. North Chicago, IL: AbbVie; South San Francisco, CA: Genentech; April 2016.
Genentech USA. Venclexta distribution: authorized specialty distributors. www.genentech-access.com/hcp/brands/venclexta/learn-about-our-services/product-distribution.html. Accessed June 15, 2016. Stilgenbauer S, Eichhorst B, Schetelig J, et al. Venetoclax in relapsed or refractory chronic lymphocytic leukaemia with 17p deletion: a multicentre, open-label, phase 2 study. Lancet Oncol. 2016;17:768-778. ClinicalTrials.gov. Venetoclax. Search results. https://clinicaltrials.gov/ct2/results?term=venetoclax&Search=Search. Accessed June 15, 2016.